This past Friday Flights was truly an event for all ages—from breakdancing toddlers (we’ll get to that in a second) on up. 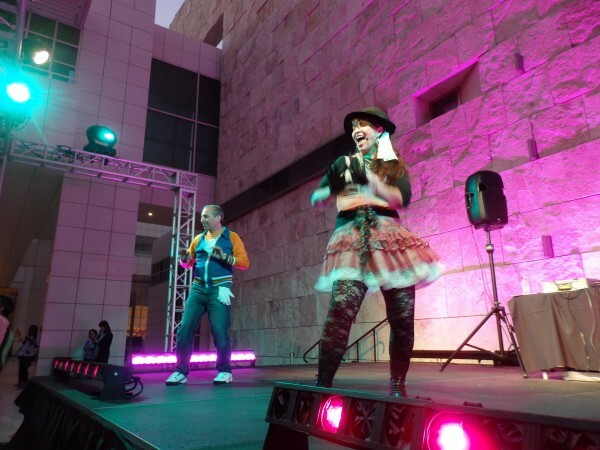 The upbeat mixing of DJ Paul V. and the energetic dance classes of Cynthia Harper and James Zimmer dovetailed nicely for a rockin’ (‘80s) night. Plus, there was a screening of Blade Runner, which, while not as neon or Michael Jackson-y, was equally awesome. I mean, Ridley Scott? Future-noir Los Angeles? Crazy eye makeup and bouffants? Harrison Ford? ‘80s Friday Flights was a real hit, if the people screaming “Encore!” at the end of the night is any indication. 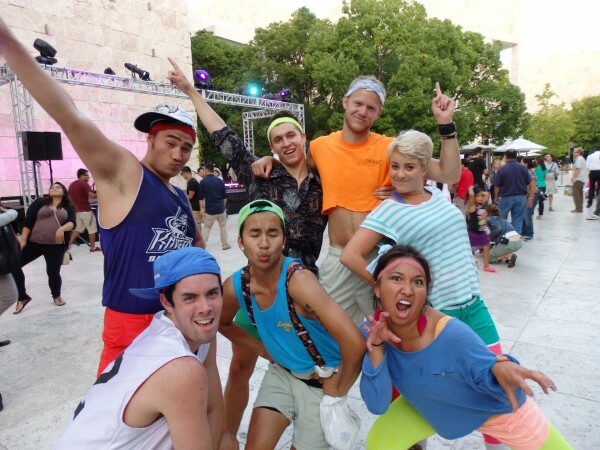 And what would any self-respecting ‘80s-themed event be without costumes? What with the neon, side ponytails, and sweatbands, we put on a low-key costume contest. Winners received Getty swag, coupons and (this is the cherry-on-top, surely) presence in an Iris post written by yours truly. Here are some of the winners! This UCLA crew came bounding (literally bounding) in from the Museum Entrance Hall. They brought a lot of fearless ‘80s flair to the night—they really shook up the dance floor, taking center stage and shakin’ it like nothing I’ve ever seen. 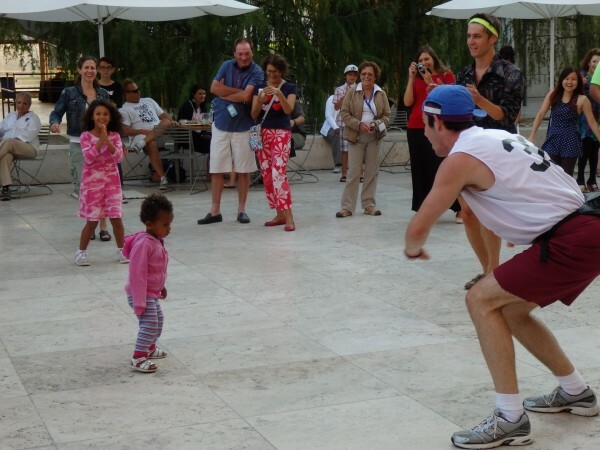 They danced with anyone brave enough to jump into the middle of their giant circle of flailing limbs; participants included an enthusiastic older woman and the thoroughly unimpressed toddler below. I swear to God, I thought I saw her breakdancing at one point. 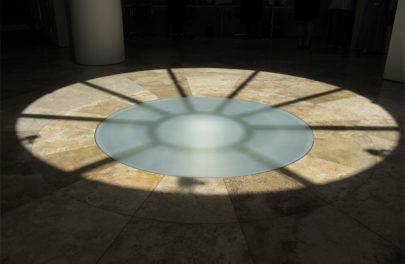 Though maybe that was just the allure of the cool travertine on a hot day—it’s surprisingly inviting to young kids. Which reminds me: I definitely saw some little boys pop-n’-lockin’ (or is it “poppin’-n’-lockin’”?) to “Jessie’s Girl.” Unfortunately, no photographic evidence exists, so you’ll just have to take my word for it. 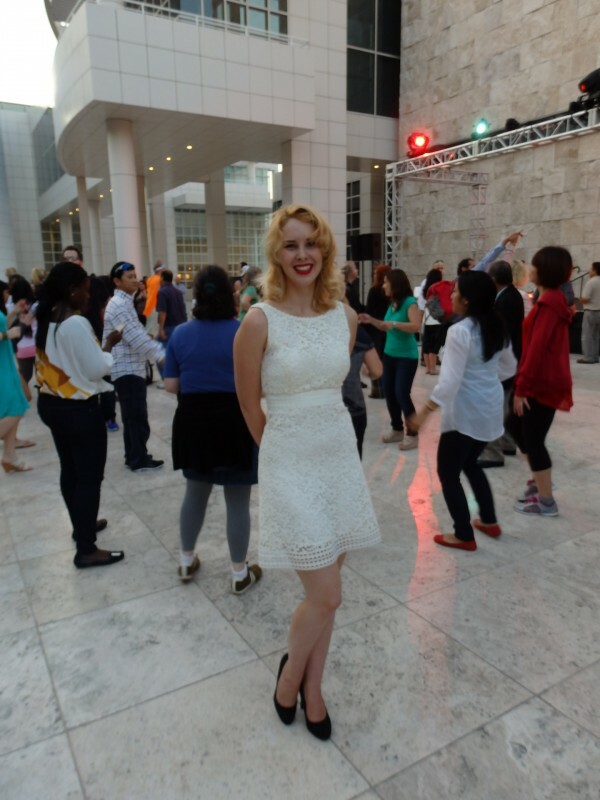 Nicole G. here came to the event as a lovely Madonna lookalike. Intentionally? Unintentionally? We weren’t sure, and it seemed rude to ask. Either way, she looked fabulous, and the resemblance was hard to ignore. 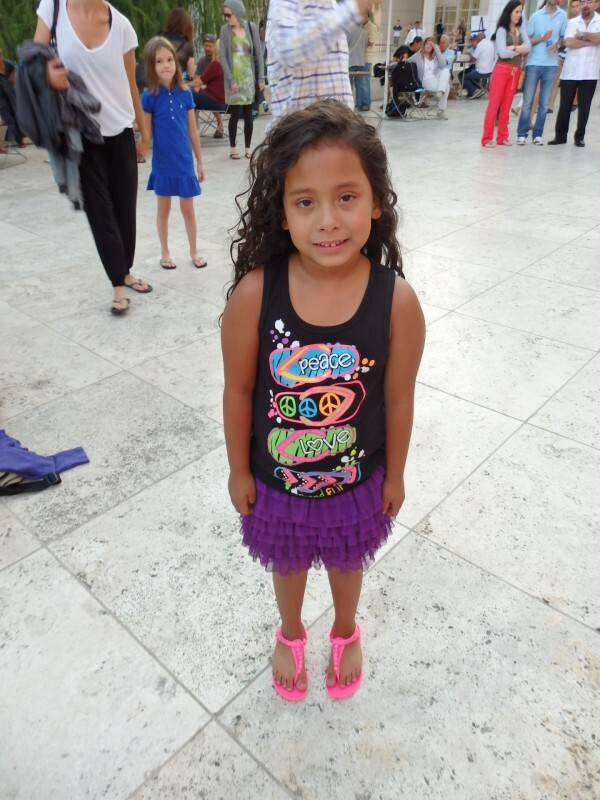 This ‘80s-tastic little girl had the greatest sandals (beaded neon jellies) ever, so she had to get a prize. Of course. And check out all the neon! And the tutu! 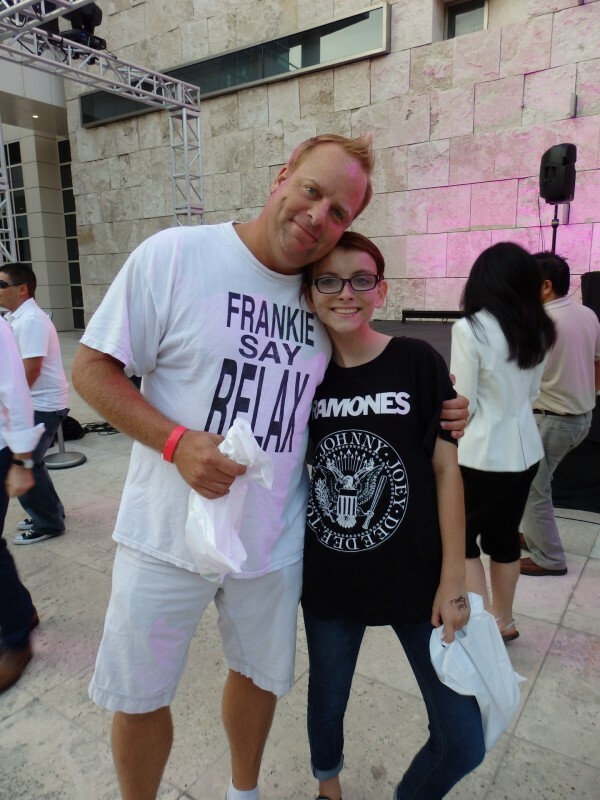 This father-daughter duo went a little more low-key with their period appropriate T-shirts—they took a different route than most of the neon-loving ‘80s ensembles, but their inversed monochromatic outfits popped just as much. Plus, I love the shout-out to two very ‘80s-specific bands. Cute, right? 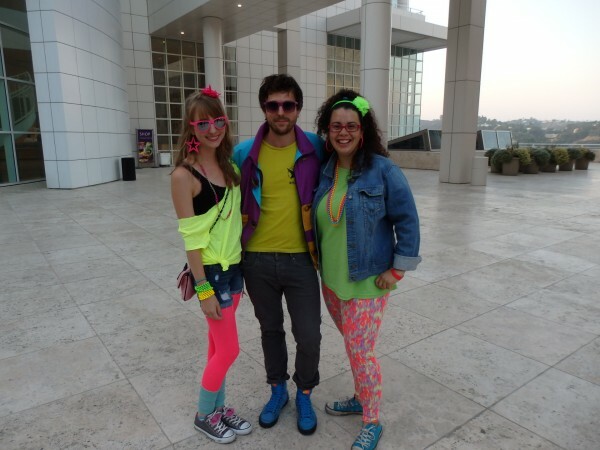 And speaking of neon…this group wowed us with their commitment to brights. I mean, they’re practically phosphorescing! Those star earrings, the hair bands, the shoes, the blinding leggings (and leg warmers! )…they really went all out. And you can’t see it as well in this photo, but the jacket worn by Joshua A. (center), which was on loan from from Allison L. (right), was so perfectly ‘80s. Apparently, it was an absolute steal at the local thrift shop! Here’s some more neon. Apparently, this group came to our last Friday Flights (‘40s themed) and felt left out without period-appropriate attire. They sure made up for it this time: the vintage t-shirts and side ponytails are a particularly nice touch. Though, correct me if I’m wrong, wedge sneakers might be a more recent trend. Ahem. …And we have another Madonna lookalike! 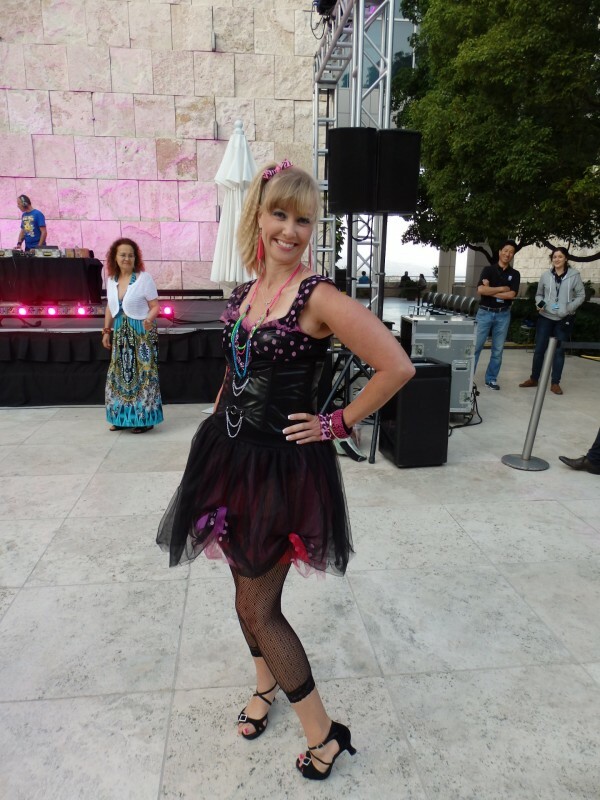 Melissa C. gave it her all with pink tulle, black fishnets, a polkadot bustier and lots of jewelry. Gotta love all that tulle. And the crimped hair—she even crimped her hair! Very vogue, eh? Eh? (Sorry; couldn’t help myself). I was trying to go for that Desperately Seeking Susan look, but I think I fell a little short. However, I did wear a lot more jewelry, eyeshadow and mousse than usual, and that should count for something, right? Dang, I should have played to my strengths; I’m personally much more of a Molly Ringwald type. I think “granny-chic” is what they’re calling it these days. Cynthia somehow managed to do full-on Madonna with a touch of Pretty in Pink. The lace tights and retro hat are period-perfect! You’d think with all the Madonnas, we’d have had at least one MJ, but alas, no. Maybe it’s still too soon? Though now that I’m taking a closer look at these pics, it looks like James has some gloves in his pocket…maybe that’s a subtle nod? 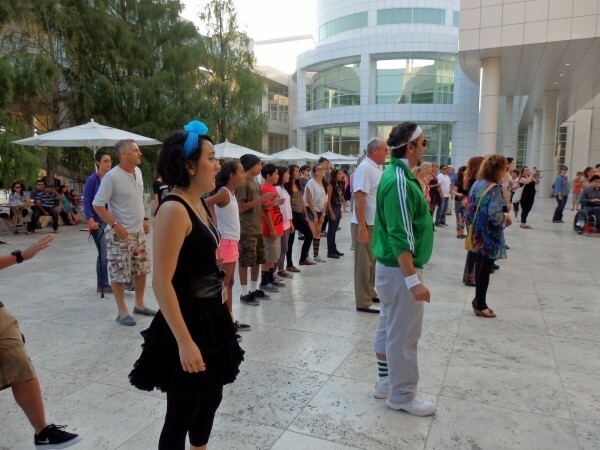 Well, conjecture aside, at least we got to learn “Thriller.” Cynthia and James led a mob of hundreds through some undead choreography, complete with zombie moves and that infamous monster walking. After we learned dance routines to “Thriller” and “Wake Me Up Before You Go Go” (and snapping silly pics at the Smile Lounge photo booth), DJ Paul V. wrapped the night up with a mix of tunes that had the crowds hopping, and screaming for more. Alas, it’s not to be: that was the last Friday Flights of the season, but we’ve got more to look forward to: Geographer is coming to this week’s Saturdays Off the 405, and I’m looking forward to attending. 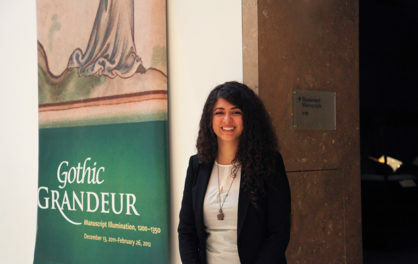 Well, you’ve gathered that I’m an intern at the Getty, but what else am I? I’m a freelance writer, a ghostwriter (though unfortunately, not Ghost Rider), and an excellent whistler, among other things. I was born and raised in California, and I self-designed a major in Creative Writing for Performance (basically, playwriting with a fancier name) at Scripps College. In my spare time, I like to shop sales, rollerblade, eavesdrop on drunk people, and watch copious amounts of TV. I must say I love Rosie Narasaki’s take on the events. Reading her words made me feel like I had been there. 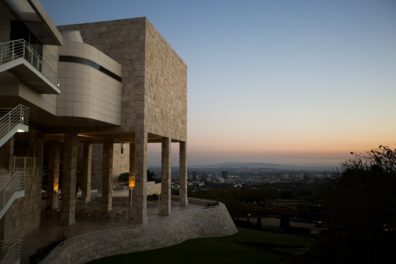 The article’s enticed me to the point that I did actually join this Saturday evening’s event at the Getty to see Geographer. It was everything Rosie’s writing prepared me to expect. The music was fantastic, the space was full of people of all ages. The crowd was energetic and polite. I so enjoyed being surrounded by the travertine and catching the view of the city and mountains. I even caught a glimpse of Rosie with her camera. I can’t wait to read Rosie’s take on Saturday’ night and the band Geographer. While reading Rosie’s great article – I could actually hear “Flock of Seagulls” and “Simple Minds” in the back of my head!! 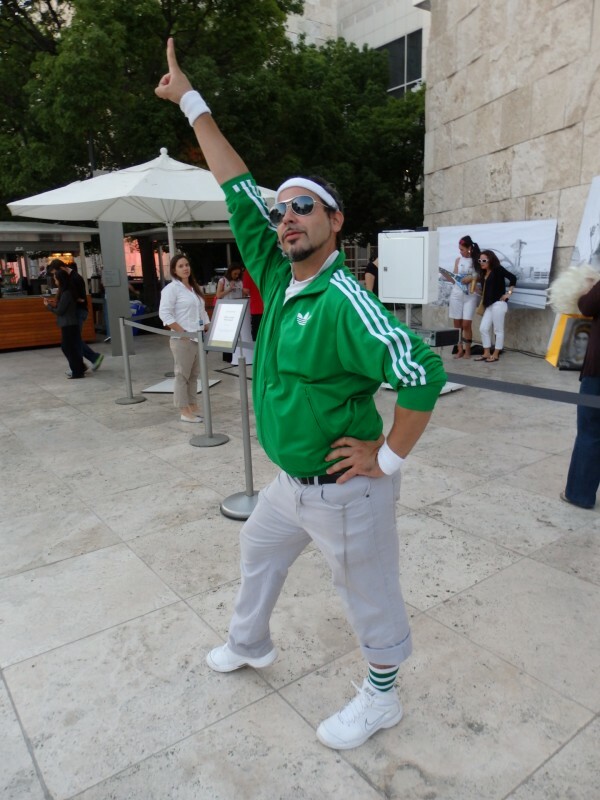 Even more than the awesome pictures (I envy Tony M.’s righteous lime green Adidas jacket! ) , her words brought the event – and the 80’s – to life!! Wish I were there. Wow – did we really look that silly? I just looked at my HS yearbook – yea, we sure did. Thanks for the memories.